I have been working on this piece for a few weeks with a special person in mind. I have never met her in person, but I felt a need to create something for her after a terrible family tragedy. So Rella, this is on it's way to you if you read this before you receive it. I hope you like it. It's beautiful Cindy! I'm sure she'll be touched and will love it. This is lovely! 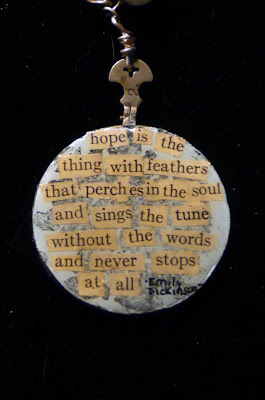 Emily Dickinson is a favorite poet of mine and I've used her in a few pieces but never this cleverly, great job. Oh....I am speechless! and moved to tears over the genuine kindess and amazing thoughfulness in making something so beautiful...for me. Cindy, this is just over the top!!! I cannot wait to hold it in my hands because I am so sure I will feel your beautiful spirit. and just a tiny BIG thing. My best friend of 13+ years gave me the middle name of 'Hope" after a few trials of life back a bit. She died a month before 9/11 and during this past month I have truly felt her by my side...and how this beautiful Hope piece. This feels so significant to me. I will treasure this always.....always. 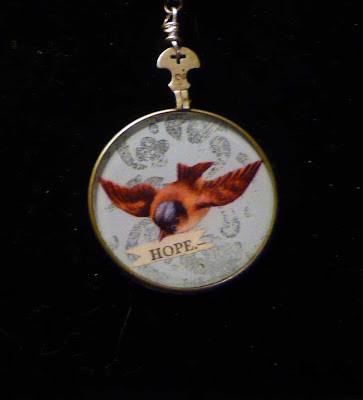 just happened upon your blog - your pendants are so lovely!